Nothing feels more cozy than a warm farmhouse kitchen. In recent years, this inviting style has become substantially popular among the finest decorators in the business. Rich, natural textures will give your home the feeling of family and tradition. Floors, cabinets, windows and other basic elements can pull together to complete the overall design. One of the simplest ways to create a welcoming farmhouse feel is to add shiplap to the walls. You will find that the popular HGTV designer, Joanna Gaines, often uses this material when refurbishing a home. Shiplap are the boards that are used to create rustic style buildings, such as barns or sheds. They are often painted white, for a French Country design. This type of wall covering is the perfect choice for a farmhouse style kitchen. Farmhouses have lots of windows that brighten up the kitchen and make it feel more spacious. The more light, the better. Consider adding new windows if your current ones are small in size. If it is within your budget, you may decide that installing additional windows is an option as well. 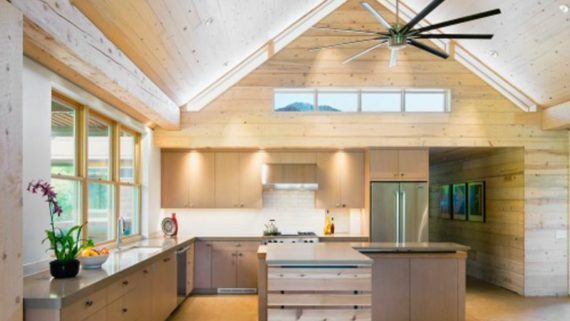 All farmhouses use wood throughout the kitchen. You will find hardwood floors, cabinets, lots of wood furniture and other wooden accents. This article reports that cherry, maple, oak and pine are the most popular wood choices for furniture and cabinetry. Another great way to incorporate farmhouse style into your kitchen is to add wooden beams to the ceiling. Many farmhouse kitchens feature glass front cabinets. 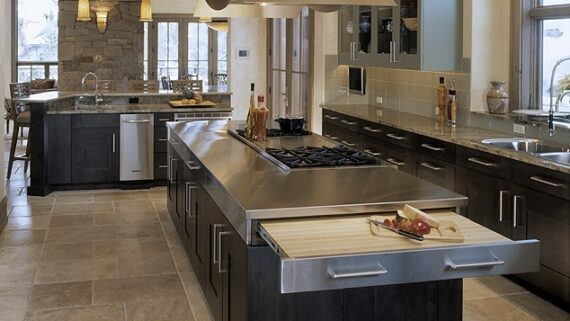 This type of cabinetry gives the space a traditional appearance. Your favorite dishes, glassware and cookware can be displayed, creating another eye catching element to the room. The thought of having all of your cabinets perfectly organized at all times may make you apprehensive. If this is the case, consider adding glass fronts to a select few cabinets that you want to highlight. 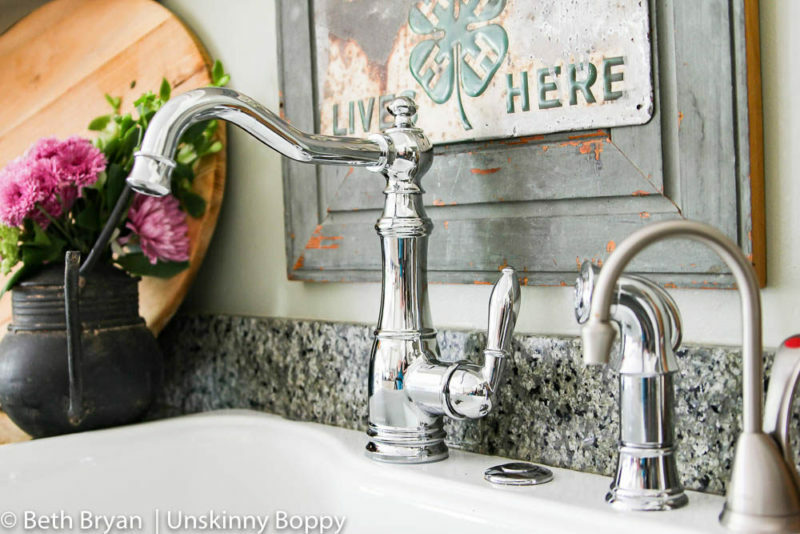 No farmhouse kitchen is complete without a farm sink. The nostalgia that it represents can send you back to a time when grandma used to stand at a similar sink, back in the day. A white, porcelain apron sink is a common choice and fits perfectly into the overall design. Not only are they attractive, but they are very practical too. These sinks are extra deep and not divided. Top it off with a hose type faucet for a modern flair. Choosing a light fixture is a small detail that can make a large impact of the overall design. Farmhouse kitchens look great when accented with rustic, galvanized steel light fixtures. If you have an island or breakfast bar, consider adding metal pendant lights above it. You will brighten up the space and add another texture element to the room. Strategically placed open shelving can be a place to add that extra little pop of color to bring out your unique personality. Often, these shelves are placed next to a window or beside the sink. These hardwood shelves will add another rustic touch to the kitchen, which will help pull the look together. The comfortable farmhouse feel can be easily achieved by implementing the steps above in your kitchen’s design. Create a space for family and friends to gather, making memories that will last for generations. 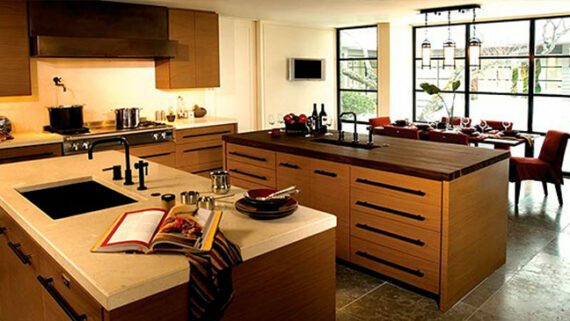 The first step in designing a beautiful kitchen, is speaking with an experienced professional. You will be able to discuss your vision, along with your budget, to create the farmhouse kitchen of your dreams. The following articles also include more information that you will find helpful: Why Your Kitchen Should Be The Hub Of Your Home and How To Revamp The Heart Of Your Home On A Budget.